When a country’s security is threatened, UN peacekeepers must intervene only after politicians have exhausted all possibilities for conflict prevention. This key conclusion emerged in the first debate in a new series of ‘Lessons from history’, held in Brussels by Friends of Europe on 19 March 2019. Featuring three peace and security experts, focused on UN operations in Africa, the event aimed to better prepare for future crises. 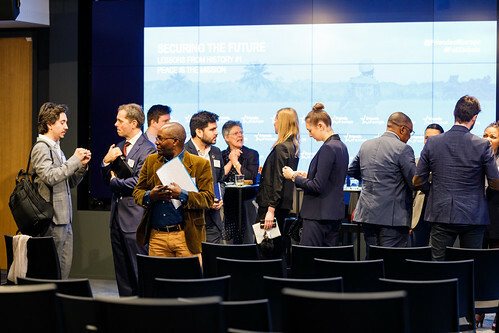 “We can learn lessons from UN peacekeeping operations in Africa, home to around half the UN’s work in that field,” said the moderator Jamie Shea, Senior Fellow, Friends of Europe and former Deputy Assistant Secretary General at NATO. He wanted to look at Rwanda and Liberia, respectively considered as a failure and success in UN peacekeeping. What more can the EU and NATO do to support peacekeeping on this continent and beyond? All three panellists agreed that countries and peacekeepers must prioritise the prevention of conflicts, with intervention only a last resort. That is more important than ever, noted Alice Musabende – a survivor of the 1994 Rwanda genocide and now an academic at Cambridge University – because conflicts are increasingly complex and involve new peacekeepers such as China. “Rwanda was the greatest failure in UN history, but it was not a UN failure, it was ours,” said Linda Melvern, Investigative Journalist and former consultant to the ‘Military One’ trial at the International Criminal Tribunal for Rwanda (ICTR). She said some UN peacekeepers had tried their best to defend the Tutsi population during the genocide. However there was a shocking lack of accountability from UN member states and decision-makers for the UN’s withdrawal in April 1994 from most of its peacekeeping operation (UNAMIR) in the country. Even today, many of the peacekeepers involved have not been properly debriefed. Rwanda did lead to the African Union (AU) taking more responsibility for intervening in the continent’s conflicts, added Ms Musabende. However, the AU is still under-resourced and mainly relies on funding from the EU, hence the importance of partnerships like this in peacekeeping. Rory Keane, Head of the UN Liaison Office for Peace and Security in Brussels (UNLOPS), noted that Rwanda and other conflicts had also led to reforms in the UN. These include better pre-deployment training for peacekeepers, plus a merger of the peace operations and political teams. The 15-year UN peacekeeping mission in Liberia ended in March 2018 and is roundly considered a success story. For Mr Keane, it underlined the value of a long-term investment in peace, having an exit strategy (the UN lacked this in Libya, leading to chaos and instability) and linking UN operations with local structures. He also said women played a vital role in the peace process, backed later by a female UN peacekeeping force from India.